A professional during the 2007/8 season, Fraser was to struggle for victories, except for at the 2007 Grand Prix where he won four matches at the round-robin stage, meaning that he would be relegated from the main tour after just one season. Fraser would attempt to regain his main tour card however, reaching event quarter-finals at the Q School in both 2011 and 2012, before he was able to go one better and qualify in 2013, defeating Ashley Carty 4-3 to seal a two-year card beginning in 2013/14. 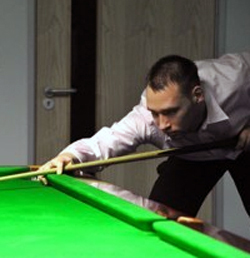 The Scot was also able to compete as an amateur during a number of events in 2012/13, notably defeating Michael White and Martin Gould to qualify for the final stages of the German Masters, as well as recording a 10-6 victory against Belgian talent Luca Brecel at the 2013 World Championship qualifiers. Perhaps surprisingly, Fraser was to struggle for victories during the 2013/14 season, notably being handed a number of difficult draws through a campaign which would see him win just three matches. The 2014/15 season was to see significant improvement from Fraser as he improved from three to 16 match wins, which included victories against Jamie Burnett and Ryan Day to reach the last 32 of the UK Championship in York. Most impressive however were his results at European Tour level as he won eight matches, including a last 16 run at the Paul Hunter Classic, in August 2014. Consequently, although he was not able to climb up into the world’s top 64 at the end of the season, his results on the European Tour were enough to see him earn a fresh two-year tour card from the start of the 2015/16 season.